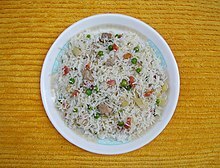 Pulao Mangsho, a traditional Indian pulao dish from West Bengal, India, with condiments and yogurt. A Chinese rice dish on a plate. A dish in gastronomy is a specific food preparation, a "distinct article or variety of food," ready to eat, or be served. A dish may be served on tableware, or may be eaten out of hand. Instructions for preparing a dish are called recipes. Some dishes, for example vanilla ice cream with fudge sauce, rarely have their own recipes printed in cookbooks, as they are made by simply combining two ready to eat foods. Many dishes have specific names (e.g. sauerbraten), while others have descriptive names ("broiled ribsteak"). Many are named for particular places, sometimes because of a specific association with that place like Boston baked beans or bistecca alla fiorentina. Sometimes not: poached eggs Florentine ends up meaning essentially "with spinach". Some are named for particular individuals, perhaps to honor them including Brillat-Savarin cheese named for the 18th-century French gourmet and political figure Jean Anthelme Brillat-Savarin, or perhaps because the dish was first prepared for them such as Chaliapin steak made by the order of the Russian opera singer Feodor Chaliapin in 1934 in Japan, or perhaps they named it for themselves because they invented the dish, or perhaps because the dish was invented in their kitchen. Because of the many stories that have been told about the names of different dishes, it is often hard to know exactly where the names came from. ^ "帝国ホテル生まれのシャリアピンステーキ" [Chaliapin steak we served for Feodor Chaliapin at the Imperial Hotel] (in Japanese). the Imperial Hotel. Retrieved 2016-11-01. ^ "帝国ホテル伝統のシャリアピン・ステーキ" [recipe for Chaliapin steak made at the Imperial Hotel] (in Japanese). U.S. Meat Export Federation. Retrieved 2016-11-01. Look up dish in Wiktionary, the free dictionary.